The luxury of velvet with a thick, soft sole, this is the ultimate welcoming hotel slipper and the most prestigious product in our range. Designed for our most discerning customers, the Prestige hotel slipper has a deep velvet lining and a sole made of 3mm EVA. 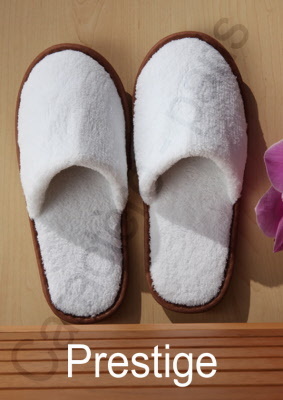 In contemporary colours of pure white with a chocolate brown trim, this is a real slipper for luxury hotels, to pamper your guests with comfort and a sense of wellbeing. Available in 3 sizes, fitting 90% of customers: 2-5, 5-8, 8-11. This slipper is available to order in small quantities (10 pairs) and benefits from a reduction of 10% - 20%, depending on the amount ordered. Try it today and take advantage of this amazing discount! Customisation available for larger orders. Please contact us at info@disposable-linen.co.uk to discuss your requirements.